The new StepPad is a powerful yet easy-to-use cognitive support tool for people who have trouble completing multi-step tasks independently. Directions that you record are played back in sequence, one step at a time, to prompt the user on what to do next. 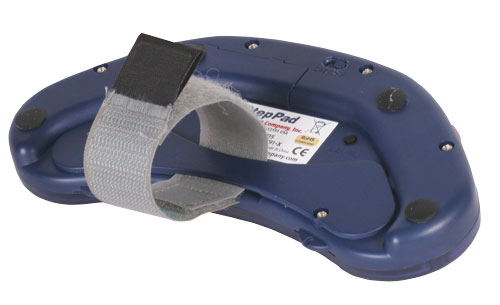 The StepPad functions well as both a short-term teaching tool and a long-term adaptive aid. The ergonomically designed StepPad is extremely portable. It fits nicely into your purse, pocket, and hands—even small ones. 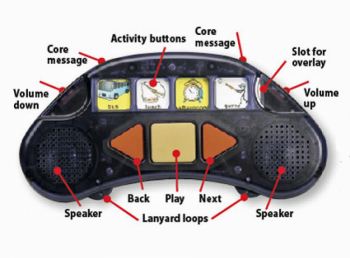 The navigation buttons are easy to press with your thumb—like a video game controller. 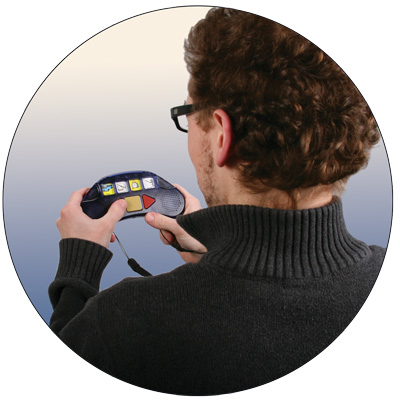 Volume is adjusted on the sides of the device, within quick reach of your index fingers. There’s easy access to two core messages. Use these for especially important information or key expressions. Dual speakers allow the StepPad to be heard in a crowd. Or you can use the headphone jack to keep recordings private. Here’s how the StepPad works: Press any of the four activity buttons to activate a step-by-step sequence. 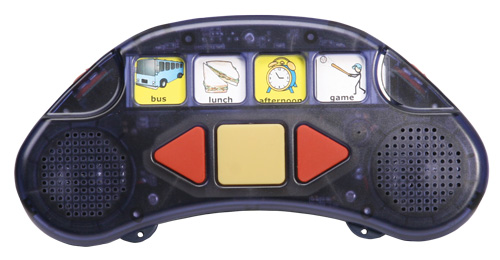 You can label these buttons with a slide-in overlay plus an auditory cue. Users hear the steps one at a time by pressing the Next button. Press Play to repeat a step. Review previous steps with the Back button. 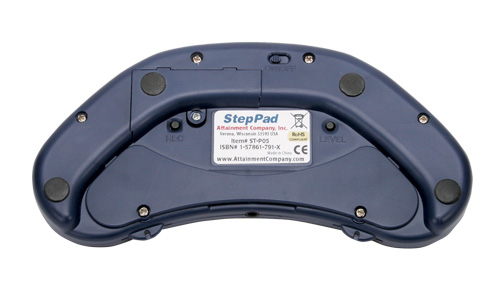 StepPad lets you record up to 29 steps per activity. There’s an eight activities capacity (four activities, two levels) yielding up to 240 step recordings. But don’t worry, it’s no big deal if you make a mistake. You can re-record any step without affecting other recordings. You can even insert a new step within a sequence while keeping all other steps intact. You can also choose to lock StepPad into just a single activity, reducing the possibility of a user getting “lost” and locking out the record and level changing functions. Lanyard and Velcro® strap are included. Size: 6½ x 2 x ½ inches.